Agreed, Tom Walker. 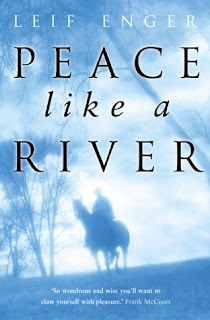 Peace Like a River by Leif Enger is a really good book. Usually the statements on the covers of books are silly and just generally uninformative (e.g. “Terriffic!” - The Washington Post…um, like, that doesn’t tell anyone anything.). The “Once in a great while” part is a bit of a stretch, considering I read a really good book last week…and another really good book a couple weeks before that. But I forgive him his exaggeration. Perhaps Tom has been going through a dry stretch in good reading. The story takes place in Minnesota in the early 1960s. It is told from the perspective of an 11-year-old boy, Reuben, who lives with his almost super-humanly nice father, older brother, and younger sister. I don’t want to give anything away…so for now I will just leave you with that. If you want a more revealing plot summary, check out this site. In an awfully dangerous place. A light through the dark and the snows. Had answered another, an hour before. . . .
And they slept as though lulled by a choir. He’d slept in the barn on the place. Gone horses, gone lady, gone outlaw, goodbye! It reminds me of a novel in verse I once read, called The Golden Gate by Vikram Seth (one of my all-time favorite authors). It takes a bit of time to settle into the rhythym of a book written in that style, but I have found that once you do, it is really fun! So anyway, I am up to page 167 out of 311. Stay tuned – next week I will let you know if the ending is good. PS: It's being made into a movie with Billy Bob Thornton (not sure how I feel about that). Check out IMDB. Hmm…now let’s talk about food. Thus far, the book takes place in fall and winter in Minnesota and North Dakota. So we’re talking cold. Some of their food sounds great – Mid-Western hearty breakfasts, including peach pie! But my question is, how were they getting peaches in late fall? Are we talking canned peaches here? I don’t do that. But this book did put me in the mood for something hearty, warm, and comforting. And thanks to my recent photograzing, a new winter squash possibility has entered my radar. Stuffed Squash. I took inspiration from this recipe, but really what I ended up making was completely original (as far as I know). So here it is, the first ever, Mollie-Exclusive Stuffed Squash. Enjoy! In a small saucepan, sautee the greens and mushrooms until they’re wilted (you can sautee them in oil, or add a bit of broth). Add the walnuts in with this to toast them. Add cooked brown rice and season with paprika, salt, and pepper. Remove from heat. Pour about 2 Tablespoons vegetable broth into each half of the squash. Stuff butternut squash with mixture, sprinkle with blue cheese, and carefully pour Tomato and Roasted Red Pepper soup over the top. Bake at 375* for about 40 minutes, or until squash is tender.